Spring Break in Traverse City! It’s official…spring break is here! While the weather may not make northern Michigan a popular destination this time of year, there are so many reasons to vacation in the Traverse City area, or even enjoy a “stay-cation” with your family during this break. The State Theatre is offering FREE movies all week. Their lineup has a huge variety- from Hidden Figures to the Lego Batman Movie, and just about everything in between! You still need to get tickets in advance and can do so at the box office or on their website for a minimal processing fee. The kids can enjoy a waterpark getaway right here in town! 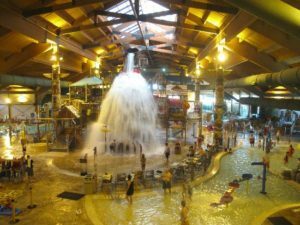 The Great Wolf Lodge features one of the largest indoor waterparks in the country. They even have a spa, restaurants, and other activities for the adults. Their “More Fun for Less” package offers special spring break savings, and “Spring-A-Palooza” event includes additional fun kids’ activities. The Dennos Museum at Northwestern Michigan College is offering free admission for children 17 & under all week. Check out their King Tut exhibit! The Great Lakes Children’s Museum is also a fun, educational place to visit with the family. For bowling, arcades, laser tag, and other fun family-friendly activities, visit Incredible Mo’s or Lucky Jack’s. Grand Traverse Resort is also offering lodging and spa specials, golf academies, and family activities such as movie nights and inflatables. Finally, if your kids are off school but you’re still stuck at work – check out some great options for spring break camps in Traverse City. Blackbird Arts, Crooked Tree Arts Center, and Professor Qwbli’s all offer fun and unique day camp options!